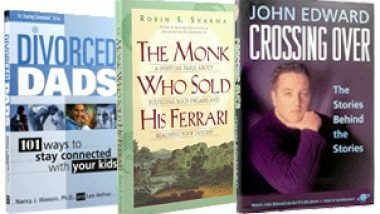 When I began writing, I fantasized about how my life would change when I became a rich and famous published author. This fantasy did not include me spending more time in the kitchen. Yet now I’m in there more than when I was raising my kids. The death of my writer fantasy occurred with the birth of my launch party for Dying for a Date. Back in my corporate life, one of our company mottoes was “feed the client.” We had chili cook-offs, pancake breakfasts, and BBQ’s. Our clients were happy and well fed. So, when my neighbor graciously offered her backyard for the launch party and offered to make dead body cookies, I was in heaven. We covered her patio with chalk outlines of dead bodies, decorated the house with crime scene tape, and wined and dined the participants. But the dead body cookies were the life of the party. My neighbor hosted a book launch party and made dead body cookies. We covered her patio with chalk outlines of dead bodies, decorated with crime scene tape, and wined/dined the guests. The dead body cookies were the life of the party. From then on, I gave away dead body cookies at all of my author events. It was great, right up until the day my neighbor went out of town, and I was forced to make 3 dozen cookies. By myself. Creating corpse cookies requires more of a skill set than I realized. If the dough is too thin, you’re stuck with a platter full of dead body parts. If the dough is too thick, the cookies resemble chubby aliens. 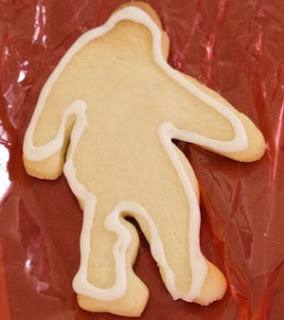 Your friends might even rudely blog about your big foot cookies just because one (or a dozen) looked like Sasquatch on steroids. After spending that entire day baking cookies, every speck of my kitchen was coated with flour and icing. I decided there was no way I was giving these cookies away for free. No sir. If you wanted a cookie, you had to buy a book. And they did. EVERYONE wanted a dead body cookie and Dying for a Date sold like crazy. At one event, just for fun, I changed the sign to read: free book with purchase of dead body cookie. 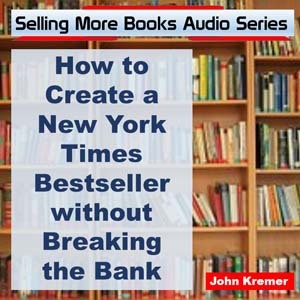 I sold just as many books. People had to have a cookie. I had created a marketing monster. How was I going to top this promotion when Dying for a Dance was launched? Without giving anything away, if you write a ballroom dance mystery, there is a high possibility that a stiletto heel may be involved in a murder. And a new literary culinary creation was born: the chocolate stiletto. A carbohydrate infused weapon that is truly to die for. And if one of the shoes looks more like a loafer, well, I am a dedicated author. I’ll go the extra mile and eat that chunky stiletto for the good of my craft and my fans. 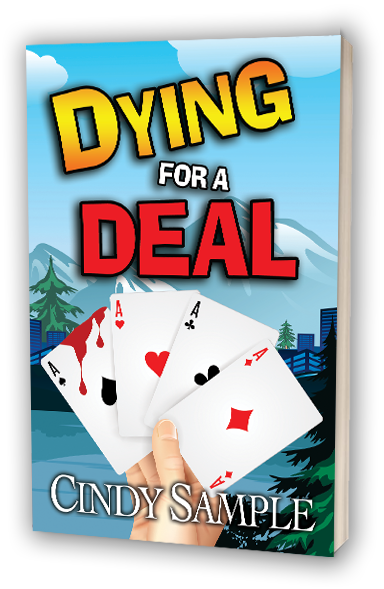 Cindy Sample is the author of two great mysteries: Dying for a Dance and Dying for a Date. 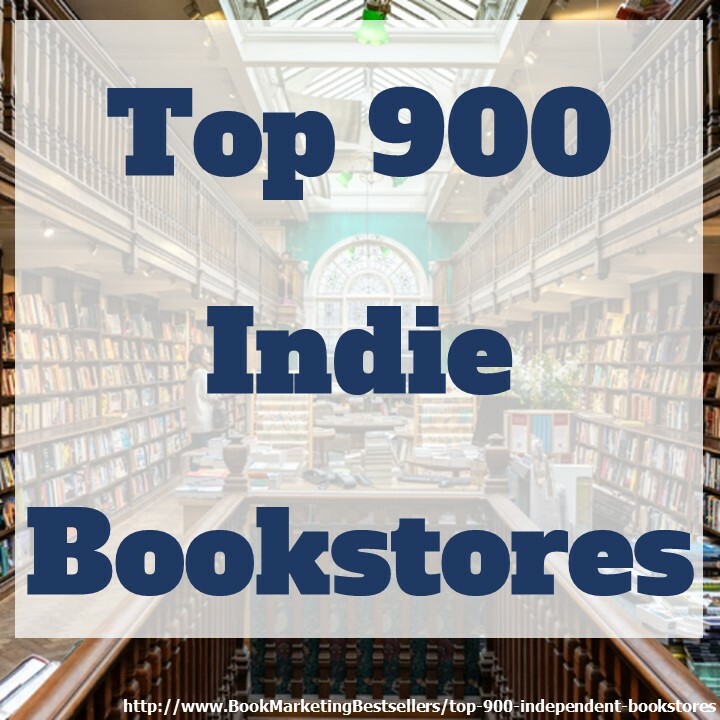 Find out more about her books at https://www.cindysamplebooks.com. 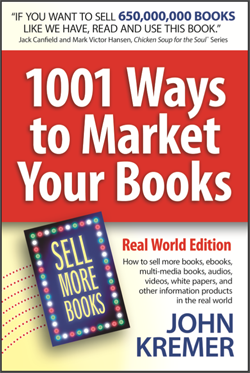 You can email her at cindy@cindysamplebooks.com. 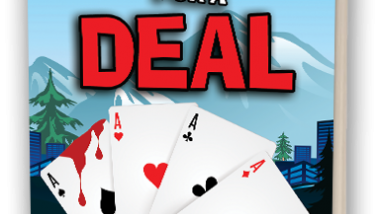 By the way, Cindy’s latest novel in the series is called Dying for a Deal. Check out the wonderful cover below. You can order her new book on Amazon at https://amzn.to/2Po70oc.